For this teddy bear you will need. 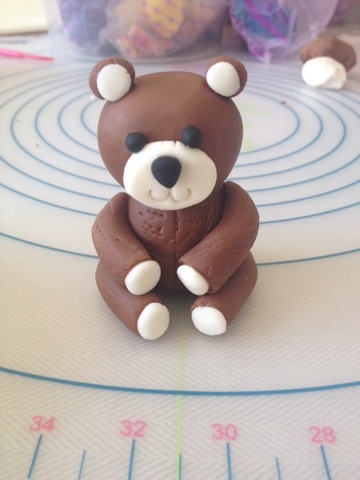 Start out by taking your brown fondant and breaking off pieces for the body, the head, the arms, the legs and last but not least the little ears. The body is the biggest part of the bear so begin with that. Take the lump of fondant and roll it in a circle between the palms of your hands. 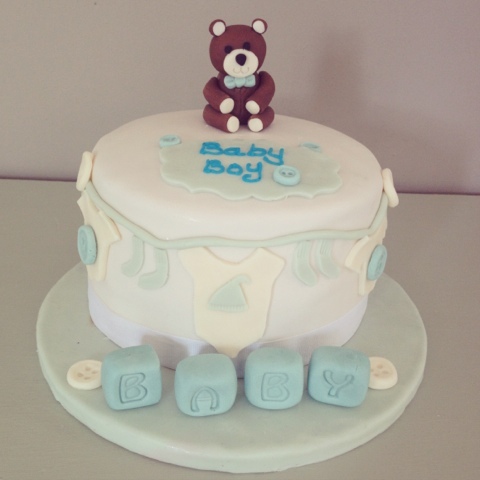 Once the fondant is smooth and soft gently make the shape of pear by rolling one end of the ball this will give the appearance of the teddies upper body and the rounder part will be the cuddly belly. Next take the piece of fondant that you put aside for the head and roll it around in a circle between the palms of your hand. Keep doing this until the ball is smooth and soft in texture. Time to make the teddies limbs you want the legs to be thicker than the arms but you will use the same method for them all. Roll each limb out like a snake one at a time on the palm of your hand. You want to keep them short and cute as they will just hug the teddies tummy. For the ears you just want to make two small fondant balls. So now to assemble, take your body and sit it upright so it slightly flattens at the bottom and can sit on it's own. Take your glue or water and dab a tiny bit on the top of the body and sit the head on top pressing it down on it. Next take your legs and flatten one end, paint the glue on the inside of the flattened part and stick to the side of the bottom of the teddy. Once the legs are on repeat the same method with the arms and stick them onto the teddy at shoulder height with the ends of the arms resting on the legs while hugging the side of the body. Now glue on the ears. Take your white fondant and roll out six little balls two for the ends of the arms, legs and lastly the ears. When u have them all rolled out one at a time gently flatten them out with the tip of your finger so it looks like a teeny tiny disk then glue them on like paws and the inside of the ears. Roll out a slightly bigger ball for the Teddy's face and flatten it like a disk on the palm of your hand. 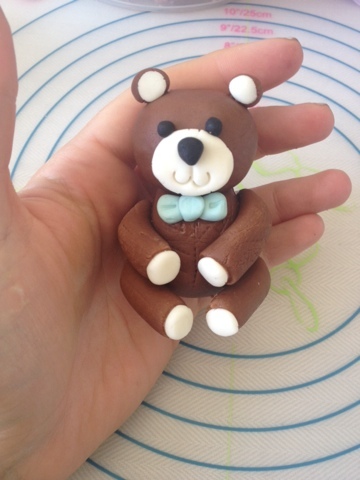 Dab on some glue a sit the fondant on the Teddy's face. 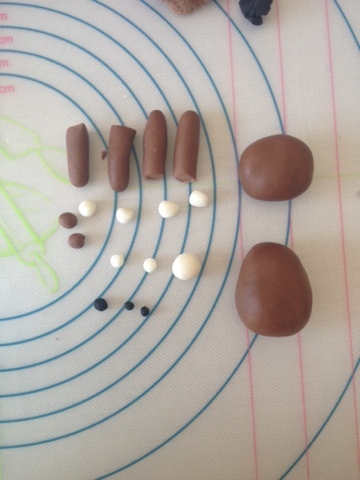 Lastly with the black fondant roll out two tiny balls for the eyes and one slightly bigger ball for the nose. I really love your blog there's a lot to share. Keep it up. Actually, I am looking for You Are My Teddy Bear Quotes. Do you have?